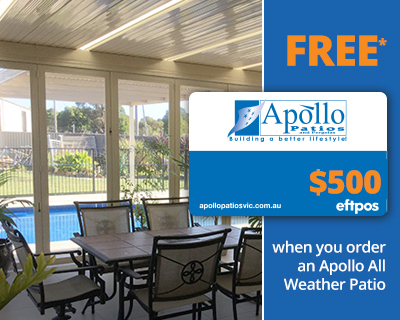 The Apollo Patios’ 0% Interest Payment Plans* enables you transform your outdoor area into an entertainment haven, while catering for your budget and lifestyle. Please see below our full Terms & Conditions. *Approved applicants only. Fees, terms & conditions apply, incl $99 Annual Fee charged on the account open date and annually on the anniversary of that date. Annual Fee must be paid in full within 90 days or it will attract interest. Minimum monthly repayment required. Interest, (charged at the standard Expired Promotional Rate) payable on outstanding balance after any Interest Free term. See skyecard.com.au for current interest rates. Credit provided by FlexiCards Australia Pty Ltd ABN 31 099 651 877 Australian Credit Licence number 247415. Skye is a trademark of FlexiCards Australia Pty Ltd, a subsidiary of FlexiGroup Limited. 48 Months interest free minimum spend $1,600. Want to know more about our Interest FREE finance options?